This is the second time this week that I have gone back and reviewed an Android app that we have previously covered here at The Smartphone App Review, with the other being the sister app to this one, DU Battery Saver. So, over a year after DU Speed Booster scored an impressive 90% in our review, has the app moved on or stagnated and what, if any, improvements have been made in the last twelve months? …this could easily replace three or four other paid apps on your phone – for free. I am happy to report that the above all stood the test of time. The app is still free, and can replace many other apps on your phone, and it still looks good and is easy to use and is most importantly, still an essential app. There have also been some improvements to the app, which I will discuss below. The big improvement is the ‘Advanced cleaner’ module. Whereas before the memory cleaner was an effective, yet functional feature, here the developer has added far more usability and extended its feature set. For example, managing unwanted pictures and videos is now much, much easier with the app being far more informative about what you may be deleting. It is a great, and really helps to augment the other established features of the app, such as the still-excellent game booster and the app manager. ★ Easily Boost: A single touch saves you time and effort to boost your phone. ★ Junk File Cleaner: Fully scan and cleanup every bit of junk and cache files. ★ Smart Cleaner: Pre-set automatic cleanup of unwanted processes and trash. ★ Powerful Speed Booster: Boost the speed of your Android by up to 60%! ★ Security Optimizer & Master: Make sure your phone is secure and protected from virus (es) or Trojan (s). What you see there is just a drop in the ocean of what the app can do for your phone, with older handsets in particular really benefiting from the features of the app. Newer models will still be helped by this software, and as there are no drawbacks in having this installed, I would still recommend getting this on even the top end flagship Android phones that barely suffer from any slowdown. At the very least this is going to save you some battery and free up a little more space. Overall, this is better than ever. 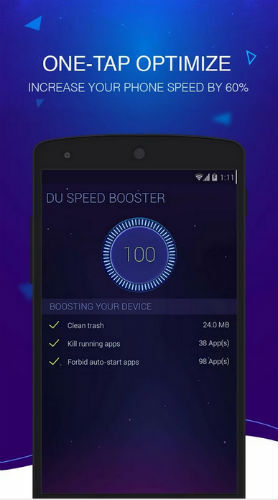 With nip and tucks to its front end and some great new abilities, having DU Speed Booster installed on your phone is a no brainer, as it can only improve and enhance the performance of your device.